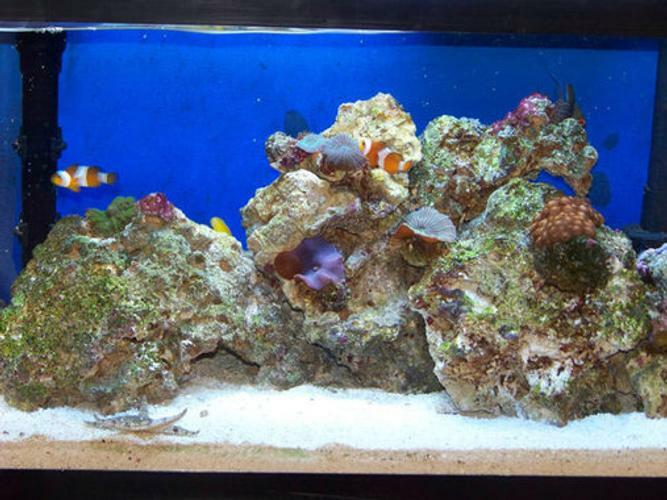 An aquarium sump can simplify the maintenance of your saltwater tank. If you are new to the aquarium hobby you may not be familiar with the term "sump". An aquarium sump is simply a storage container that can be used to house aquarium equipment and as an overflow box for extra tank water. When it comes to setting up a saltwater tank the list of necessary equipment seems endless. In order to keep your tank running properly you need to invest in a quality aquarium heater, a protein skimmer, a filter and more. The last thing you want to do is install another piece of equipment but a sump may actually make your life as an aquarium hobbyist easier. Sump systems are a simple way to organize all of your tank equipment and they provide a number of other useful benefits. If you are looking for a way to simplify your tank maintenance, consider adding a sump. Simply put, a sump is just an extra container that can be used to hold aquarium equipment, filter media and extra water. By utilizing a sump system in your saltwater tank you can avoid the clutter of having a filter, heater and protein skimmer – plus any other equipment you may need – hanging on the walls of your tank. Sumps can be hidden discreetly in an aquarium cabinet below the tank where they will not only be out of sight but easy to access for tank maintenance. Rather than removing your tank hood or disassembling your light fixtures just to gain access to the back of the tank for equipment maintenance, you can simply open up your tank cabinet and have immediate access to all of your tank equipment. Another benefit of having a sump is that you can use it to hold additional or specialty filter media. Most aquarium filters have limited space for filter media but by using a sump you have plenty of space to add more. A sump is also the perfect place to cultivate beneficial bacteria for biological filtration. Perhaps one of the biggest benefits of a sump, however, is the extra space for water. If you set it up properly, a sump can actually serve as a back-up water overflow system in the event that your power fails. It is also a great way to top off the tank and to add supplements to the water without pouring it directly into the tank. Is a Sump Really Necessary? If you are unfamiliar with aquarium sumps you may be skeptical about the idea. To many aquarium hobbyists, it may seem like a lot of extra work to set up the sump and to transfer all of your tank equipment to a new location. In the long run, however, having a sump will save you a great deal of time. Using a sump will simplify your water changes and consolidate all of your aquarium equipment in one place. In addition to these practical benefits, having an aquarium sump also contributes to the aesthetic appeal of your tank. The sump itself is full of water which is pumped to and from the tank – depending on the capacity of the sump this could result in an increase in total water volume. Additionally, the constant flow from the sump will result in an ever-stable water level in your main tank. The best part about choosing an aquarium sump is that you can set it up any way you like – you have the freedom to customize the sump so it provides whatever benefits you desire for your tank. Most commercially-made sumps have some options for customization, allowing you to rearrange or change the size of the compartments. Many aquarium hobbyists, however, choose to build their own sumps using an extra glass tank and ?-inch sheets of glass as dividers. If you are using a sump for the first time, it may be best to purchase one rather than building your own. In terms of organizing your sump, you need to first decide on the direction of water flow. Your aquarium filter pump will be placed on one side of the sump to draw water from the tank – the water will then pass through the other compartments of the sump before being pumped back into the tank. In addition to the filter, you will also need an aquarium heater and a protein skimmer. The heater will help maintain a stable water temperature in your tank while the protein skimmer removes proteins from the surface of tank water. In addition to this basic equipment, you may also want to incorporate some live rock and beneficial algae to help maintain the nitrogen cycle in your tank. When setting up your sump you may need to experiment with a few different configurations until you figure out the best way to make everything fit. Once you get your sump up and running you will be amazed at how much of a difference it makes for your saltwater tank.